This year I vowed to try my best to expand JanzCrystal Handcrafts. Aside from creating handmade jewelries for ladies I'll be making pieces for little ladies too, of course using only Austrian Swarovski Crystals. 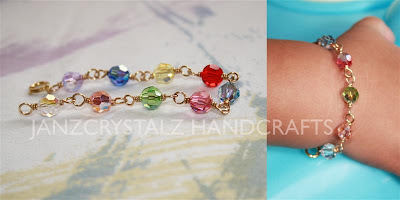 Thus, I'm sharing to you a very simple yet elegant creation that will fit your little princesses cute wrist. 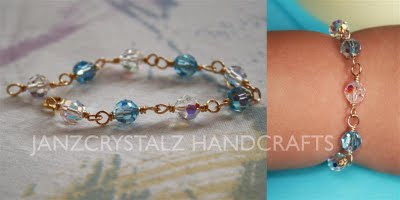 These bracelets we're designed using 6mm round swarovski crystal beads joined by .64mm thick 14k gold filled wire, and 14k gold-filled spring ring locke. Pieces were made with quality hand craftsmanship. Feel free to visit our FB Page and Online Shop for details. 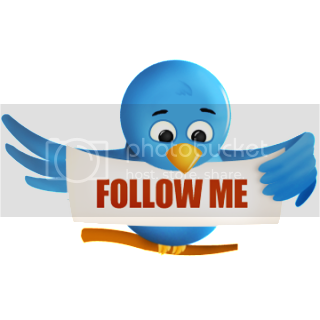 hope you can visit one of my entries too, thanks! very cute jan. you are creative. aaww... ure right! cute for pretty little princesses! 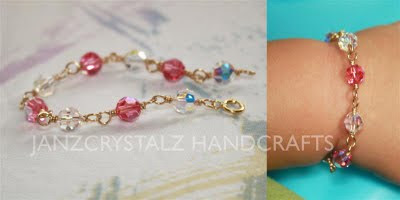 very delicate and pretty bracelets, loved them, visiting from pf, hope you visit me back here http://www.jessysadventure.com/2011/07/first-ride-on-her-pink-car-seat-pink-friday-entry.html if you did thank you so much. wow, you're into business? loved the bracelet. nice one! Swaroski is a well known brand in the jewellery industry.The ornaments for kids are not available very easily.Thanks for the handcrafted jewellery you provide for our kids. this one is soo pretty!